'Innovation" and 'Christmas' are two words one seldom sees paired together in the same sentence. Christmas, and holidays in general, are full of traditions and messing with these traditions can be seen as sacrilegious. Imagine the reaction of people in mid-sixteenth century Germany when they saw the first Christmas tree in a home. It then took another two hundred years before that new-fangled invention arrived in England. Actually, breakthrough innovations abound within the holidays. Christmas carols date back to fourth century (AD) Rome and came to Northern Europe in the ninth century, while Christmas carols in English first appeared in the early fifteenth century. Christmas cards are a one hundred and seventy-five year old tradition that took off with the advent of postal services, which, in its current form, is from around that same time. Christmas cards would be prominently displayed as to advertise one's connections and social status. Santa Claus, in his current form, is a quite recent phenomenon, being no more than one hundred and fifty years old and, over time, evolved from the original thirteenth century St. Nicholas into the twentieth century "Coca Cola Santa" that we know and love today. Gift bags are another recent addition along with speed Christmas shopping and environmentally responsible recyclable paper and fabric bags. While, click and ship, the newest addition makes last minute shopping easy and convenient. With a constant flow of new traditions being added, others are being phased out with the increasing secularization of societies. Some traditions have been purposely transformed, such as "Merry Christmas" being replaced with "Happy Holidays" in many circles so as not to 'offend' anyone. 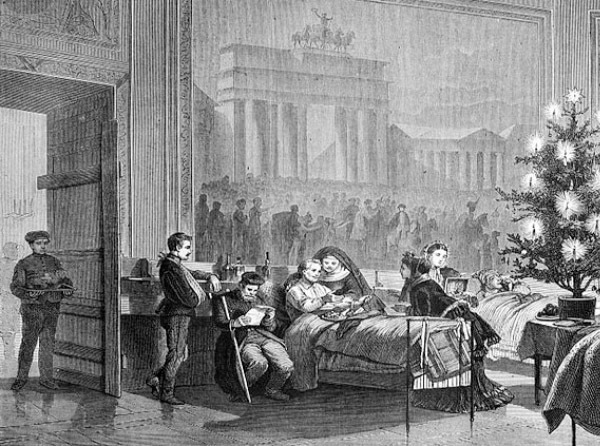 What might the Christmas traditions of the future look like? Christmas traditions have evolved slowly and then spread with increasing speed, along with everything else in our lives and this holiday season seems to increasingly divorce itself from its original roots. As with all future predictions, no one really knows the answer to this question. However, without the shopping, it would probably already have blended in with all the other holidays of the year. As we grow up and the need for additional 'stuff' diminishes, gift exchanges may follow suit since one can be perfectly happy with a warm pair of wool socks. For children, on the other hand, Christmas offers a time of magic, where the home is transformed and anticipation builds until it becomes unbearable. As a child growing up in Copenhagen, I can remember the wonderful Christmas celebrations in our holiday house with our impatience and expectations growing by the minute. The children experienced Christmas Day as the absolute longest day in the year. The three-course dinner seemed to drag on forever while the grownups dithered about cleaning off the table, doing dishes and making coffee until finally they gathered around in the living room for the opening of the presents. The rest of the evening seemed to fly by, with children taking turns opening presents while pilfering candy plucked from the tree. Christmas peace eventually came as the tiny, real candles lighting the tree went out one by one. Soon, the living room was completely dark and Christmas was officially over. We all went to bed with warm and loving feelings and fond memories of our precious gifts. In Denmark nothing much has changed in this regard. One is still greeted by "Merry Christmas" rather that "Happy Holidays" and the presents are wrapped in old-fashioned glossy paper and bows with real candles decorating the tree. It would seem that the future has yet to arrive in that magic land and the present is still much like the past.